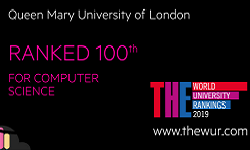 Computer Science at QMUL is ranked 100th in the world, making it the 8th most highly ranked in the UK. Engineering and Technology at QMUL, which includes Electronic Engineering, has a global ranking 101-125 making it, together with two others, 9th most highly ranked in the UK for this subject. THE World University Rankings is the only global university performance table to judge research-intensive universities across all of their core missions: teaching, research, knowledge transfer and international outlook. They use 13 carefully calibrated performance indicators to provide the most comprehensive and balanced comparisons, trusted by students, academics, university leaders, industry and governments.